This is Rachael's personal horse Ghost. He rode great when she purchased him and was in wonderful weight. There was no reason to believe anything significant was going on. Once home, she noticed a bad odor coming from his mouth. He again rode wonderful for her, but she asked me to look at him when I arrived home that evening. ​This is what I found. 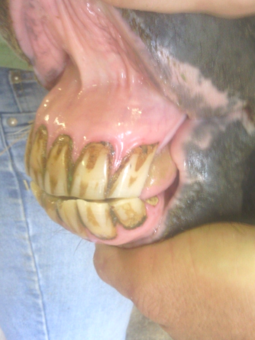 This poor horse had huge ulcers throughout his entire mouth. The sides of his tongue had lacerations from sharp points. He also had a cracked tooth that was infected. His incisors had a significant wave as well as a nasty case of gingivitis. It was obvious he had not had adequate dental care in quite some time. However, he was still an easy keeper and was soft and responsive in the bridle. I spent well over an hour with hand and power tools removing sharp points and balancing a mouth that was literally a train wreck. I had to keep giving Ghost breaks because horses will become sore in their TMJ if the mouth is left open for periods of time. We washed his mouth out twice daily and the infected tooth required antibiotics. 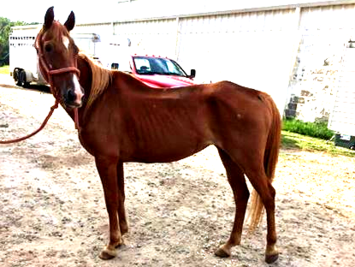 This horse was very lucky he ended up with Rachael because he needed extensive dental care that we were able to provide daily. Ghost all healed up. After several weeks of washing his mouth out twice per day with a antiseptic solution, his mouth showed significant improvement. We will maintain him on a 6 month schedule with monthly exams. This is a picture of a miniature horse I worked on in early 2012. 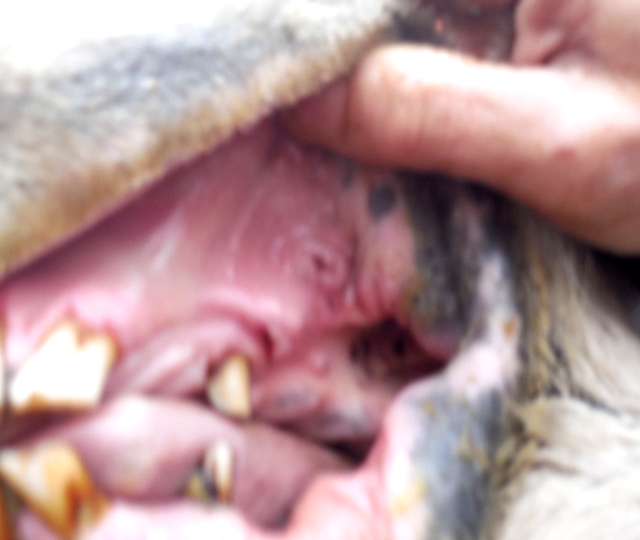 As you can see, her incisors were not only causing problems nipping grass and hay, but they were not allowing her mouth to move in order to chew her feed well. The picture on the left was before I began working on her and the picture on the right was after I finished. 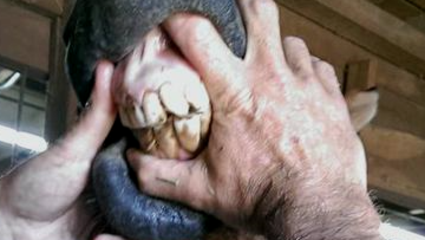 Horse's teeth are like dog's toe nails. Even if they are long, you can only take so much off at a time. 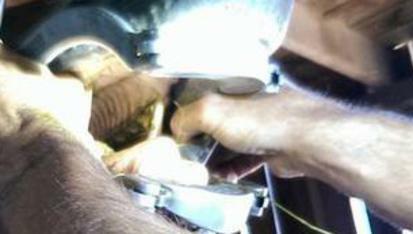 If you take too much tooth off at once, you will expose the pulp chamber, which can cause bleeding and pain, as well as set the horse up for an infection. 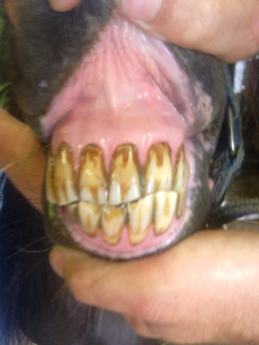 In these cases, we will recheck the horse in several months and reduce the incisors again at that time. 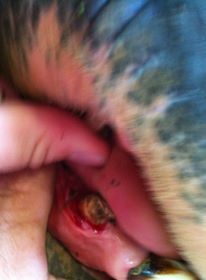 This is an example of a tartar ball that can build up on the canine teeth and actually grow into the gums and cause an infection or abscess. This is a fairly large tartar ball and you can see where it had grown into the gum and was packing food under the tartar ball. 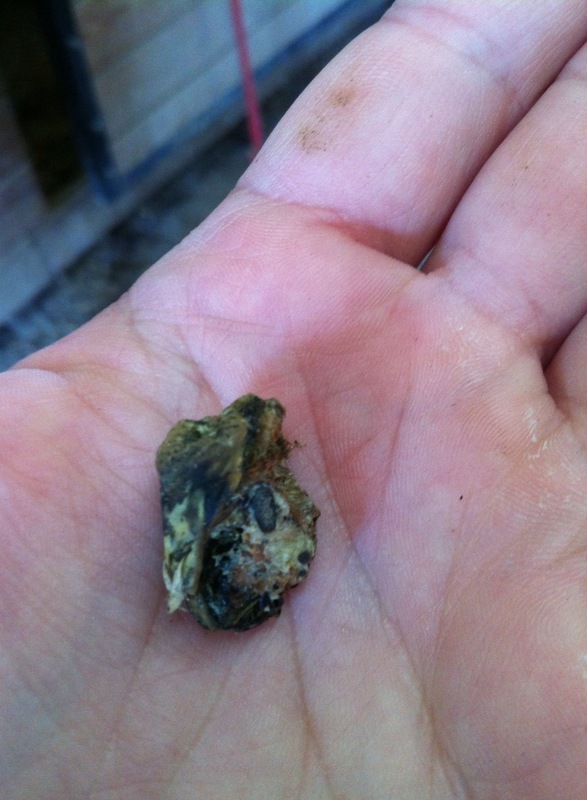 An infection was just starting so we were lucky enough to catch it before it became severe. I was called out for a horse loosing weight. When I arrived, the first thing that caught my eye was the extensive DGL slant. Look closely at the picture on the left. The top teeth on the left side of the mouth are long and the teeth on the bottom are short. 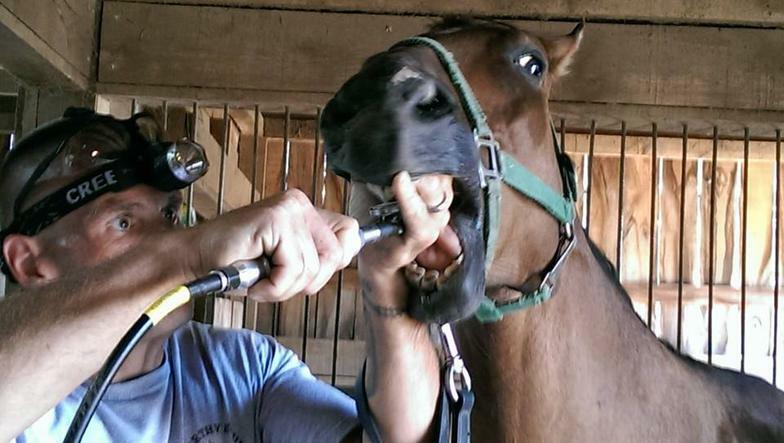 This was basically causing the jaw to lock into place and not allowing the horse to chew its food. 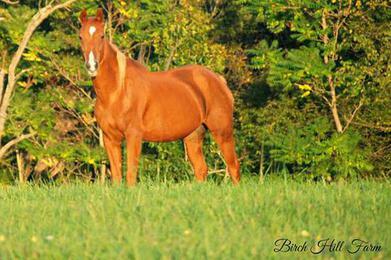 This horse was out on a lush, beautiful pasture and was continuing to loose weight. I was able to reduce the slant as much as possible. 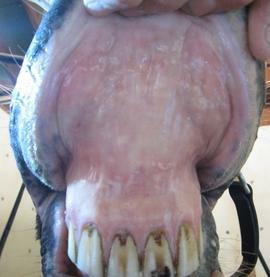 Again, a horse's teeth are like dog's toe nails. They have pulp chamber and can only have so much taken off at one time. If too much tooth is taken off, bleeding and infection can occur. The next horse was a very interesting case. 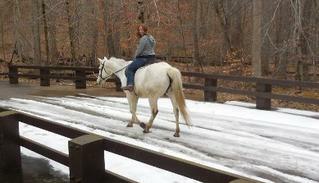 He was a rescue, but was in good weight and rode very well. I was asked to check him and this is what I found. The horse's incisors were completely out of balance. On the left side of the mouth, one of the top teeth was so long it was overtaking the bottom tooth. 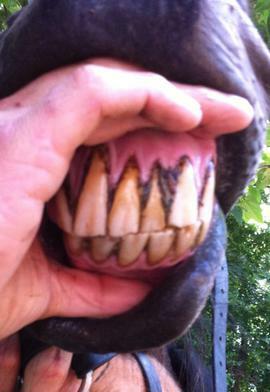 This makes it extremely hard for the horse to chew adequately. Look very closely at the picture on the left. Can you see the far upper tooth on the left side of the mouth? It is the very last tooth in the picture. Yes, that is a tooth that has basically grown from the top all the way to the bottom gums and the bottom tooth is almost a nub at this point. In the picture on the right, I have taken as much top tooth off as possible to allow the bottom tooth to grow properly. I will follow up with this horse in three months and take more off, as I did not want to get into the pulp chambers and cause any damage. 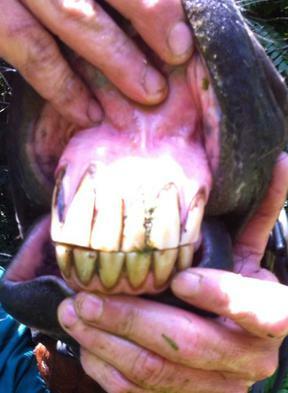 Unfortunately, this horse's back teeth were as bad as its fronts. He had several long, over-powering top teeth. 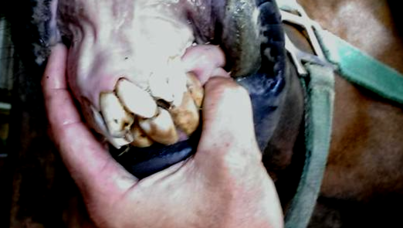 I did end up using power tools to reduce the excessively long teeth, as it would have been inhumane to expect the horse to stand while attempting to make such changes with hand tools. This is a perfect example of why I have power tools. I much prefer hand floats, but in cases like this, it is kinder to the horse. 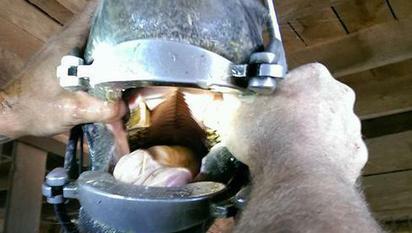 The final two pictures are of the back of the horse's mouth. In the picture on the left, you can see the very long, overpowering tooth directly in front of my right thumb. In the second picture, you can see that tooth has been reduced considerably. 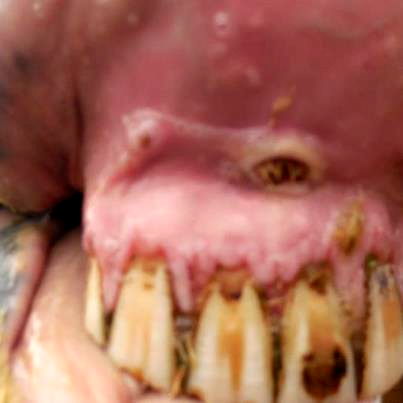 This horse is a perfect example of why it is important to have routine dental care. His mouth would had not become this bad had he been floated on a routine basis. Thank you Sharron Hancock of Lilly Pond Rescue for these fantastic pictures. 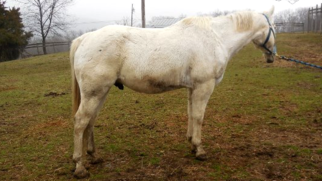 This mare was rescued by Birch Hill Sanctuary in West Virginia in 2016 (yes, THIS year!). She is well into her late 20's and it was obvious she had not had routine dental care in many, many years. Her jaw had almost no lateral movement and she was forced to chew like a dog. In just a few short months after her dental needs were addressed, she literally looks like a different horse! Thank you so much Kim for allowing us to use your pictures. She is a perfect example of why appropriate dental care is imperative.